When I first saw a picture similar to this one posted by CNN Africa with tweet description, "Is this what Lagos would look like in 2050?" on LindaIkejis blog and the rain of abuses Nigerian Twitter users had already bombarded on CNN Africa, I was ready to join in cussing CNN Africa too, because of that tweet, till I saw a tweet that made me visit CNN Africa's website to read the full story. Reading the post on CNN Africa, I found out that Olalekan Jeyifous is the mastermind behind this picture. 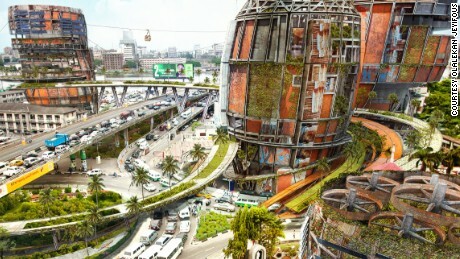 He recreated a Lagos in 2050 where massive shanties made of tin, tower over Lagos luxurious real estates. According to him, the picture depicts Nigeria's marginalized poor citizens. "Lagos is one of the fastest growing mega cities......and a fertile ground for architects"... One of the location he pays attention to in his pictures is the Makoko river slum. He explains that Slums are viewed as an unsightly eyesore to be bulldozed, leaving their inhabitants displaced, in order to make way for luxurious waterfront properties similar to Bar Beach, along Victoria Island, Lagos. He also states that his pictures are not a prototype for Lagos New build, but the important point to take away from them, is that, development should include the disenfranchised and not just the rich or middle class. I totally agree with what he has said, properties in Lagos that are being developed nowadays, are designed solely for the middle and upper class citizens, leaving the former inhabitants displaced. If every real estate property in Lagos is designed to cater for the middle and upper class, where do we expect the low class people to live? On the roads?, as even the slums around waterfront areas are now being developed to suit the middle and upper class expectations of how Lagos should look like. This also brings me to another issue, the new law in Lagos, that hawking is banned and offenders get 6 months imprisonment or pay a huge sum of money, we all know they can't afford to pay or even if they have it, that's like their life savings. There are no jobs for these hawkers, as most of them are not that educated, if they are, maybe just primary school or junior high school education. I am aware that this law was imposed because of the recent accident that involved a hawker, but, is it fair to take away these people's only source of livelihood? Are construction firms shutdown, if there's an accident involving a worker, or Are oil rigs closed down because someone died while working in an oil rig site. I hope the Lagos government re - examines some of their actions against the low class citizens of Lagos.The low class people shouldn't feel left out of the ongoing developments happening in their own state and country. True talk.. Most laws are partial to a group of people as the government do not try to look at the big picture.